Wild About Gardens Week, the annual celebration of garden wildlife hosted by the Royal Horticultural Society and The Wildlife Trusts, is teaming up with Hedgehog Street this year to highlight how gardeners can help our hedgehogs. This much-loved creature is declining in Britain as fast as the tiger. • A national call to action to create hedgehog holes in fences – a handy 13cm by 13cm template can be downloaded from the Wild About Gardens Week website. • A competition to design the best hedgehog home. There will be three categories: individual, group and school. The prizes will range from a trail camera to a visit from a hedgehog expert. Closing date: Monday 9 November 2015. 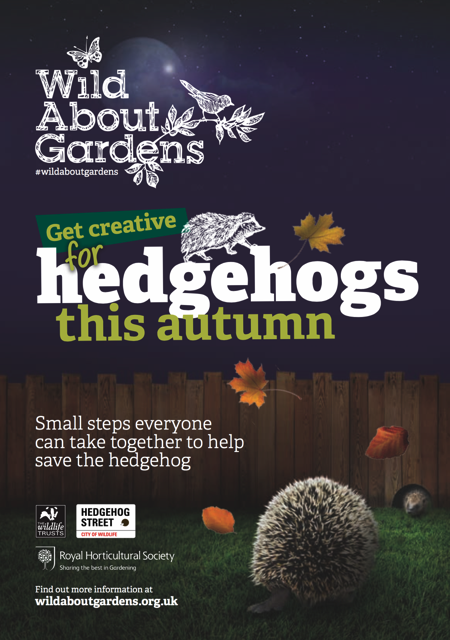 • A downloadable new booklet, available from the Wild About Gardens Week website, will demonstrate steps you can take to help hedgehogs in your garden. • Today there are estimated to be fewer than 1 million hedgehogs left in the UK. The main drivers are thought to be: declining hedgerow quality; the over-management of parks and green space; loss of gardens to paving/decking; reduced insect prey from chemical use in gardens and on farmland; loss of grazing land; the fragmentation of land by roads, fencing and increasing density of native predators. • Adult hedgehogs travel between 1-2 kilometres per night over home ranges between 10-30 hectares in size. For more information about how to help hedgehogs please see notes below or our new ‘Get creative for hedgehogs this autumn’ booklet – now on the website.